Complex mineral fertilisers can be produced via various processes or production routes. An important production step is the conversion of the phosphor from the natural rock phosphate into a plant available form. One of the possible processes to do so is called the nitrophosphate route or Odda process. 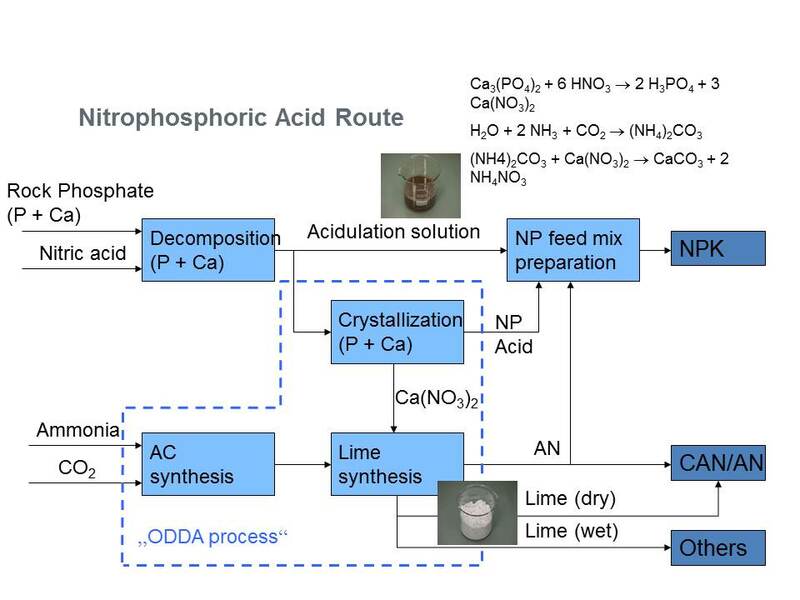 The advantage of the integrated Odda process is that not only the conversion of phosphor takes place but also all nutrient components are used to produce nitrate containing straight and complex fertilisers. Integrated process for production of nitrate containing straight and complex fertilisers. All incoming raw materials are transformed into high quality fertilisers. No solid waste is created (as compared to phosphogypsum) and minimal gaseous or liquid emissions. Replacement of mined dolomite or lime as filler by own produced lime, with savings up to EUR 5 million per year. Consumption of CO2 gas from ammonia production. Fertiliser production includes various examples of circular economy, but depending on the interpretation of the Waste Framework Directive 2008/98/EC, a number of currently used raw materials in the production of mineral fertilisers might be excluded from the list of allowed raw materials (CMC1) in the new fertiliser legislation, even if REACH-registered, hampering in this way the principle of circular economy. The Odda process is an example of intrinsic circular economic principles, and has to be protected from misinterpretation of Directive 2008/98/EC or CMC1 definitions.